A review requested by Andrew Milne, with thanks for supporting Alternate Ending as a donor through Patreon. We now live in a world where it seems like goddamn near every movie has massive CGI worlds, no matter how low-key and human-oriented it might be (I believe it was reading about the massive amount of VFX in plonking Oscarbait The Theory of Everything that clued me in to just how pervasive CGI landscapes have become in modern filmmaking), but it was not ever thus. Really, the idea that you could create substantial amounts of the environment that actors have to interact with inside of a computer is only some 15 years old, getting its first mainstream work-out with Star Wars: Episode II - Attack of the Clones back in 2002. What that film mostly demonstrated was that depriving actors of a physical set to work against (or, in extreme cases, other actors) makes them at least slightly terrible, but it was still the success it needed to be: the 2000s became a grand era for finding different ways to replace physical sets. Even so, this kind of wholesale digital architecture is mostly reserved for scenes where it must be used, or at any rate places where it would be easier to use it, or even just cheaper, given that VFX artists are easier to overwork than unionised carpenters. The point being, full-on "virtual backlot" productions - ones in which there were no sets at all, just green screens and whatever props the actors absolutely had to directly interact with - were and remained the odd rarities, noted more as curiosities than anything else (arguably, even the ones that make enormous, ungodly sums of money, like Avatar and The Jungle Book). Still, it was a thing they tried to make happen, and they succeeded in a most excessive way in 2004. In that year, filmmakers in three different countries more or less simultaneously set to work on creating their own sci-fi epics set against impossible CGI worlds: the first and worst was the English-language French production Immortal, the third and probably best-known was the American Sky Captain and the World of Tomorrow. This leaves our current subject in the middle, probably the best of them all - the best of a somewhat dubious lot, but still - the Japanese Casshern, directed by Kiriya Kazuaki, and based (not with any excess of fealty, as I understand it) on the 1973 anime series Neo-Human Casshern. Which isn't quite as exciting as Sky Captain being elliptically based on the Fleischer Superman cartoons, though it makes more sense that such a thing could exist. The film has a whole lot of plot - and I only saw the cut-down American version, some 25 minutes shorter than the original* - much of it enormously complex and overripe, all of it treated with extreme seriousness by Kiriya and the rest of the filmmakers. It's busy as all hell, and this has understandably led many and many a critic to declare that it's "confusing", but it's really more that it's just incredibly fast-paced. It's the kind of film that feels like it has completely reinvented itself at least once every fifteen minutes. But if we were going to try describing the overall plot of the thing, we might start by calling it a superhero origin story attacking military scientific research on dispossessed populations, in the wake of a horrible 50-year war. Going any deeper would require confronting the way that Casshern is telling at least three broadly different stories, in order. First up is the story of how Dr. Azuma (Terao Akira) has discovered a new form of human cell, one that promises to help the world rebuild from its recent hell, though it takes very little familiarity with ny of the genres that broadly describe Casshern to guess that Asuma's tests are even shadier than "experimenting on an isolated ethnic group" already suggests. For one thing, we know that things are terrible between him and his son Tetsuya (Iseya Yusuke), who joins the military around this time and dies a year later. Which brings us to the second story, in which Tetsuya's disembodied spirit drifts through the world as Azuma's experiments start to go awry, while his rival Kozuki (Kohinata Fumiyo), father of Tetsuya's fiancée Luna (Aso Kumiko), works to perfect a new prototype for battle armor. As will happen, a storm turns all of Azuma's lab-grown human parts to turn into sapient beings, who flee to a remote castle full of killer robots from the last war. And then along comes the third story, which is basically kind of like Dune, with the resurrected Tetsuya filling the role of a protector deity named Casshern. I swear that it's all clearer in the execution than I've just made it sound, though the sheer volume of plot does indeed become a bit overwhelming. Still, it's clear that the filmmakers take it seriously, which does manage to separate it out from Immortal and Sky Captain, both of which feel substantially more like technical demos than Casshern ever does. I do wonder if this has something to do with Japan's substantially more robust tradition of sci-fi animation than either France or the United States - Immortal and Sky Captain are both, to some extent, ruptures with existing storytelling, while Casshern is more of a new iteration of something that had already been ongoing for years. At any rate, the film's not "just" interested in the power of the digital toolkit to create amazing, fanciful settings or impossible physics, though there are considerable examples of these things. Certainly given how much work it takes to parse the story and how little it actually ends up yielding (the thematic concerns of this plot are not by any means new to anime), it does feel easier to focus on the imagery as the film's main subject, for it is very striking, no doubt. Even when the CGI falls down on the job, it's still striking, and this happens fairly often: the textures are often just too damn smooth, which in turn make the composited images look like actors standing in front of a flat plane, and so on. But the design! It's a routinely beautiful film, even when it's working in such decidedly low-tech areas as using high-contrast black-and-white to flesh out traumatic flashbacks, or bathing its on-set actors with bold swaths of cherry red lighting during one of the most overtly horror-derived scenes in the film. The scenes of Tetsuya's spirit wandering through the world are even lower-tech still, emphasising the stagey conceit of his "ghost" costume and leaving spectacle behind altogether, for some particularly atmospheric images of general melancholy. Still, when the CGI environments come into play, that's when the film is at its most unique. Take, say, the shots of the Neo humans, as Azuma's experiments call themselves, standing across a mountain from their ruined castle home. These don't look "realistic" in the slightest, but judged purely for their sense of grandeur and the painterly colors involved, this is exactly what's promised by the phrase "live-action anime". 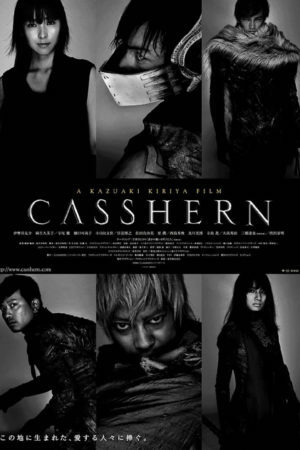 It's beautiful and evocative, it feels truly of a different world, and when Casshern is tapping into this sense of awe, it most fully earns the somewhat exhausting world-building it takes to get there. It's certainly not the case that the film is a poor narrative work, though it does maybe take a lot of shortcuts in its characterisation, and I'd be hard-pressed to name any of the actors who give more than what's barely necessary (where as some - including, unfortunately, Iseya - probably give less). There certainly is something breathtaking and exciting about a film that covers this much ground in so little time, and the sheer fact of the film's momentum ends up being as important to its quality as a story as anything to do with the denotative content of that story. It's much more a film about experiencing things rather than necessarily thinking about them, and we experience enough things for it to be a bit overwhelming, all told. It's not as conclusive a demonstration of the medium's potential as one might have hoped for back in 2004, let's say; an admirable proof of concept, and gorgeous, but maybe it's not unfair to say that it's more impressive for its parts than its whole. *This was, I would like to state for the record, an error, not a choice.